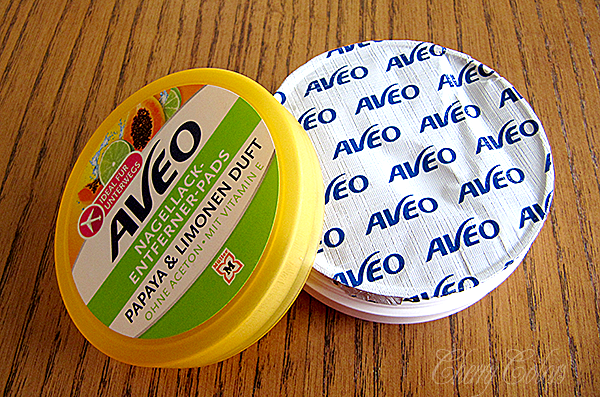 Review: Aveo Nail polish remover pads - Papaya & Lemon - Cherry Colors - Cosmetics Heaven! 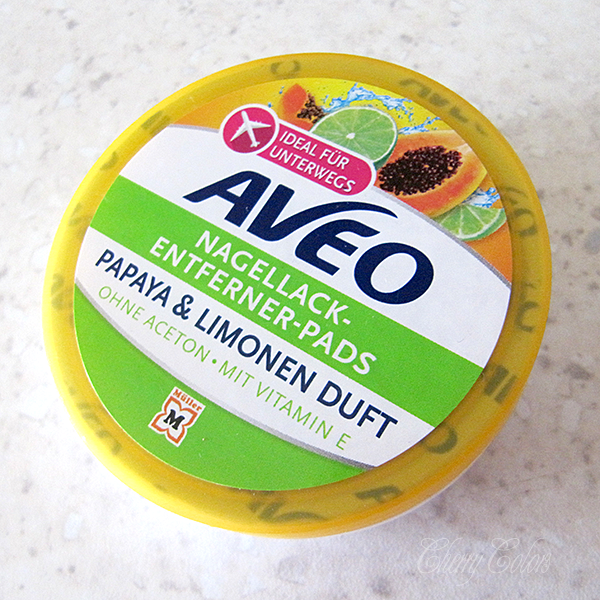 Today's review is about these Aveo pads, that I picked at Muller for 0.95€. They are very affordable and since I wanted to try such a way of removing nail polish, I picked them up. 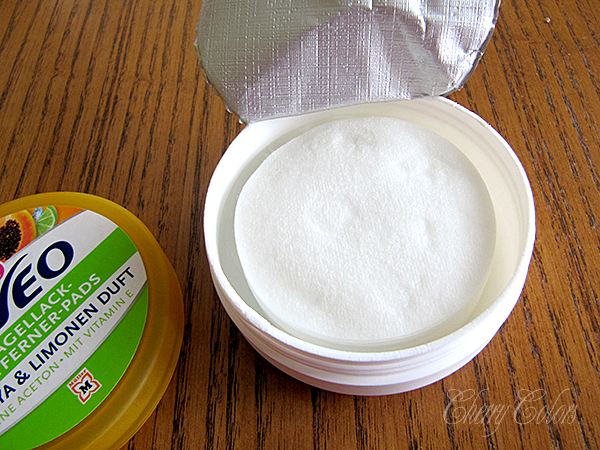 The packaging: Is sturdy, looks nice and it seems that it does its job. There was no leaking of the remover and there is no scent once the lid is tightly on. Each package has 30 pads in it. The pads are very thin, I'd say paper thin and are somewhat moist. They are more on the dry side, which honestly, surprised me. The scent: It's strong, but not overpowering (not until you leave the package open for a couple of minutes). It has a distinctive papaya scent, but not too sweet since there's some Citrus in it too. So I'd say it's an OK scent. Artificial, but that was to be expected, after all it's a nail polish remover. How did it do? I had textured Kiko polish on my nails, which is a pain to remover any way. 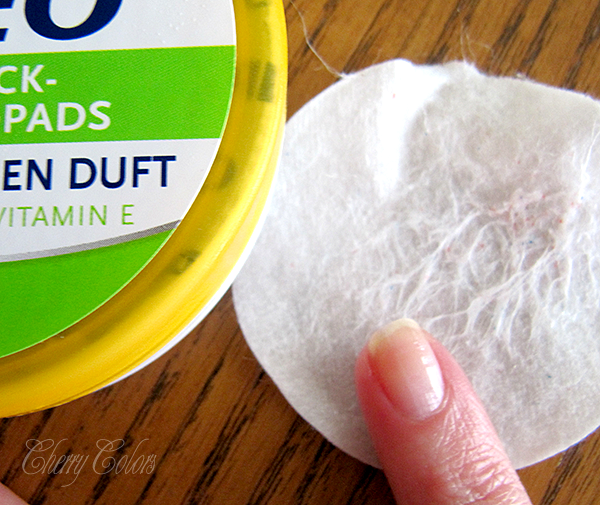 With these pads it took me one full pad and some vigorous scrubbing to remove the polish from one nail. I later tried to remove different polishes with it; light cream polishes went off great, I needed 1 pad for one hand. For dark polishes it was 2 pads for one hand. After the removal there was this sticky film left. Not exactly on my nails, but on my skin, on the table where I put down the used pad. Yuck! 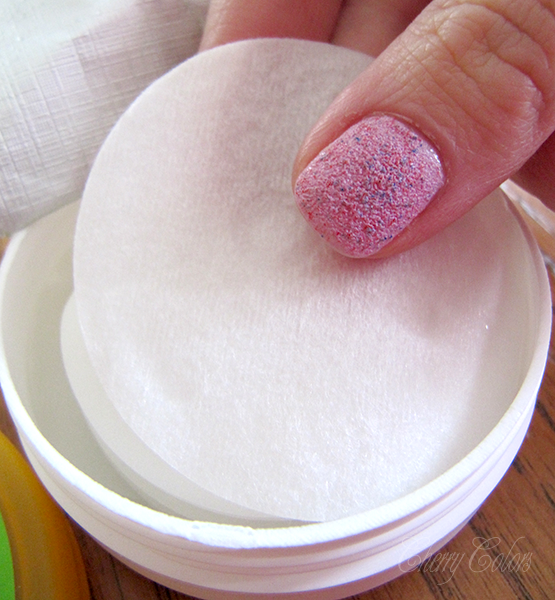 These are my first pre-packaged nail polish remover pads, and for such an experience I think they did OK. Not extremely well, but for such a price I didn't expect much. They did their job well, the scent is OK and I really wish they didn't leave a sticky residue behind. I do like that it has a non drying formula (for the cuticles and skin). I hope Aveo will come out with more different kinds of these, because I can see myself using them on the go. Overally I am pleased with them, but will be waiting for an upgraded version/new scents before repurchasing.